Jane Springfield's landscape paintings, based on hiking and backpacking trips, have been accepted in many prestigious exhibitions and have won numerous awards. Her favorite painting locations are wilderness settings and national and state parks. She is drawn to the spontaneous nature of watercolor that allows quick interpretation and unexpected results in her work. She also works in oils, primarily in plein aire. On location or in her studio, she creates paintings inspired by what she sees on travels or in local scenes. Jane is a native of Atlanta residing in Marietta, Georgia. She holds a Bachelor of Fine Arts from the University of Georgia and takes classes and workshops from nationally recognized artists. Jane began exhibiting and selling her work in 1980 and has painted full time for many years. In previous careers she was an agency art director, catalog producer and high technology marketing director. A Member of Excellence with Atlanta Artists Center and Signature Member of Georgia Watercolor Society, she exhibits locally and nationally and is in many private and corporate collections. She has had several one-woman shows of her work. 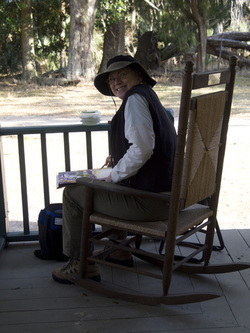 Jane was selected as the Artist in Residence for Sapelo Island in 2008. My favorite studio is the great outdoors. I love to hike wilderness trails and explore scenic places. While I love to travel the world, I always find inspiration in my native Georgia. Much of my work focuses on the elements of nature: rocks and water, mountains and trees, and the patterns of light and shadow that define them. Each of my paintings elicits a memory of being in a special place at a particular moment. I hope to share this experience with those who view my paintings. I am thrilled to be a member of the talented Ossabaw Artists Collective.